Shortly before her death, Mrs. Mary Blades Miles gives her Leonardtown property, known as Rose Hill Farm, to Father Charles K. Jenkins, S.J., pastor of St. Aloyosius of Leonardtown, with the instruction that it must be used by “a religious order to conduct a Catholic school.” Various religious orders visit the site, but are discouraged by the dilapidation of the building and the isolation of the district whose only means of transportation was by boat. Father Jenkins invites Mother Helena Torney and Sister Marie Meynard, Sisters of Charity of Nazareth (SCN), to Rose Hill. Traveling from Kentucky, the sisters must have thought it providence, as Southern Maryland was the birthplace of their founder, Mother Catherine Spalding. After much consideration, the Sisters of Charity of Nazareth – the twelfth order Father Jenkins appealed to - decide to hazard the undertaking in the spirit of their motto, "The love of Christ impels us." In August, the steamer Thompson arrives in Breton Bay carrying Mother Helena, Sister Rosanne, Sister Gregorita, Sister Bertilla and Sister Madaline Sharkey. In September, St. Mary’s Academy opens as a coeducational, K-12 boarding school with 17 pupils, two of whom are boarders. During the first year, the number of pupils increased to 33. The number of boarders at the Academy has increased to six and a windmill is installed so all could now enjoy hot running water. 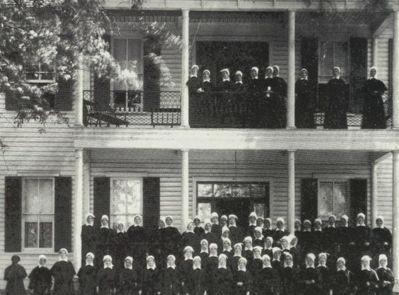 The first graduation exercises of St. Mary’s Academy are held in June 1888. There are two graduates: May Greenwell and Whittie Burch. Repairing the century-old convent is no longer practical and, in March, it is torn down and work begins on a new one. On November 21, the new chapel and building are dedicated. 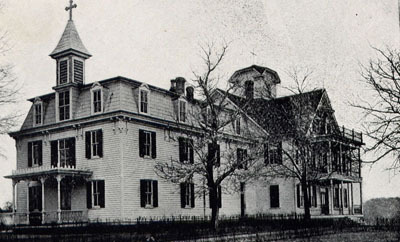 The Leonard Hall School is founded by the Xaverian Brothers with Brother Constantine McGuiness as the director. Brother Julian Ryan, author of "Men and Deeds," writes "The primary object of Leonard Hall was to establish an agricultural school in order that the boys of the county might receive scientific instruction in farming...At the same time they would receive a liberal education that would enable them to appreciate the finer things of life." Boys now attend the Academy for grades 1-4 and Leonard Hall for grades 5-12. Leonard Hall will remain under the control of the Brothers until 1971. The Xaverian Brothers purchase over 100 acres along Breton Bay known as the "Willie Abell Estate" from Mr. Enoch Abell. In the beginning, the land was used as a camp for boys known as Camp Calvert. Young men flocked from the cities to spend a few weeks of their summer vacations at Camp Calvert. The Academy continues to grow as a coeducational boarding and day school for students from kindergarten through twelfth grade. The high school of Leonard Hall closes and in September male high school students return to the Academy. The burgeoning population of St. Mary’s County and Southern Maryland means increased enrollment for the Academy. The current school is too small and the cornerstone for a new school building is laid by Bishop McNamara in March. In April, the new Academy building is dedicated. Brother John Chrysostom Killian converts Leonard Hall into a boarding grammar school with a naval training component. During the Second World War, with the rationing and shortage of gas, school social activities and athletic games are curtailed. The Academy opens a new dormitory, convent and chapel. 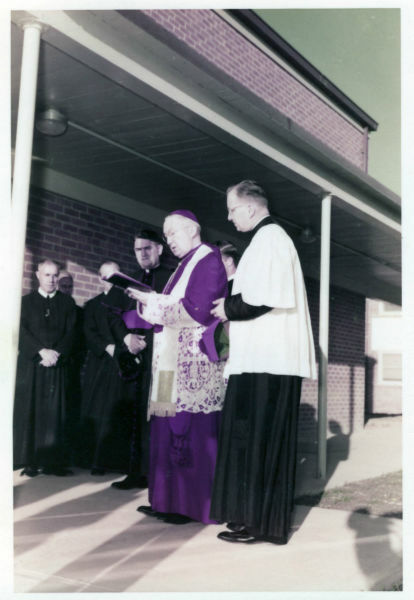 The Brothers' Saint Joseph Juniorate in Peabody, Massachusettes, closes and the aspirants are moved to Leonardtown, where Brother Lambert Bents begins construction for a juniorate and Ryken High School on the grounds of Camp Calvert. The following Brothers are assigned to the school and juniorate: Walter, Augustus, Placidus, Borromeo (who would later become a principal), Joseph Gerard, Pius, Hugo, Basil, Gabril and Scott. According to Brother James Kelly, "the early days at Ryken were enough to make pioneers tremble. The Brothers and aspirants lived at Camp Calvert during the first year of the school until they were driven out by the winter's cold and broken water pipes. 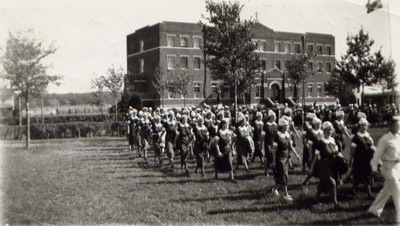 The aspirants decamped to Xaverian College (in Silver Spring), and the faculty of Ryken moved to Leonard Hall while they contined to teach the 'day-hops' and run the juniorate at Ryken. In his journal, Brother Lambert describes the endless discomfort from coldness, dampness and perpetual mud. He writes that "relief from this discomfort was offered by Captain Neblett, USN, who offered athletic and shower facilities at the naval base, 12 miles away...Lester Mattingly supplied us with wood for the stoves." Construction is soon halted by a steel strike and Brother Lambert faces the challenge of having students, but no school. Brother Hilaire, headmaster of Leonard Hall, brings good news. Father Morgan Downey, S.J., pastor of St. Aloysius Church in Leonardtown, offers the use of the new Father Andrew White school to the Brothers. The young men will attend classes at the elementary school from 3-7 p.m., but getting them there becomes a problem. The St. Mary's County Commissioners will only supply transportation for a regular school day, not for one beginning at 3 p.m. Parents quickly organize bus transportation and then subsidize it at a cost of almost $300 per month. In February, the almost-ready Ryken High School opens even though work is still being completed on the building, such as installing doors. Brother Lambert writes, "Finally on February 25, 1957, a Monday, school started at Ryken High School from 9 a.m. to 2:40 p.m. 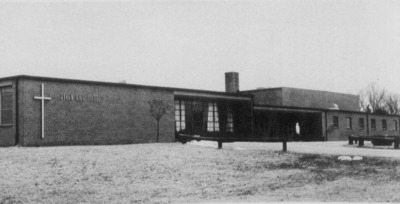 While construction continued on that day, the school opened with classrooms. There was no cafeteria, no gym, no office, no faculty room and no science lab, as yet. The hallway is used as a lunch room with the food being served by Brother Scott and myself. Despite all the inconvenience, it is a blessing to get on a regular schedule." Named for Theodore James Ryken, founder of the Xaverian order, the school served as a juniorate for those with vocations to the Xaverian Brothers as well as a high school for young men in Southern Maryland. All of the boys from the Academy were transferred to Ryken. RHS is dedicated in June and 23 students are members of the first graduating class. His Excellency, The Most Reverend Patrick A. O’Boyle, Archbishop of Washington, presides. 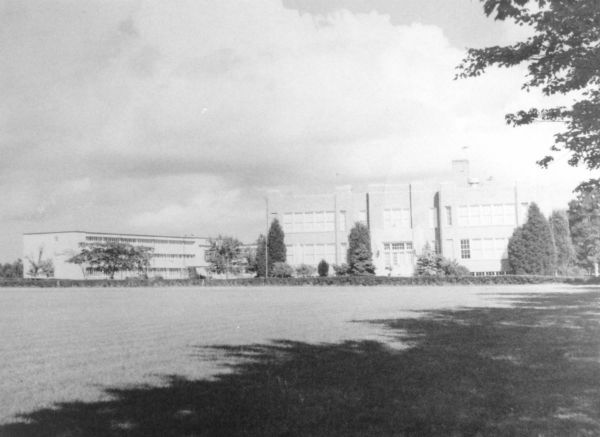 The juniorate and boarding facilities at Ryken close and, with Brother Cornelius Hubbuch as principal, Ryken becomes a day school. 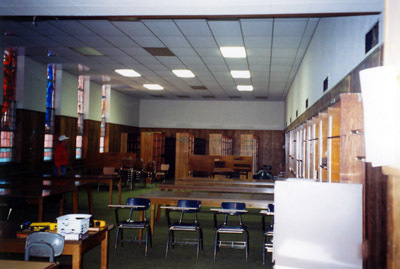 At Ryken High School, classes are held only in Paschal Hall, named in memory of Brother Paschal (Thomas S. Raley) who died at the age of 18 and only weeks after receiving his habit as a Xaverian Brother. Students were forbidden to go to the two buildings on the lower campus, where the Brothers and aspiring Brothers lived. 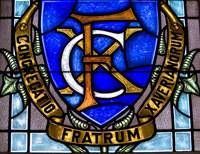 Rupert Hall housed the young men of college age who were studying to become Brothers, and Xavier Hall housed those of high school age. But with the closing of boarding facilities and rising day-student enrollment, the Brothers turn Rupert Hall into classrooms and facilities to accommodate more students. 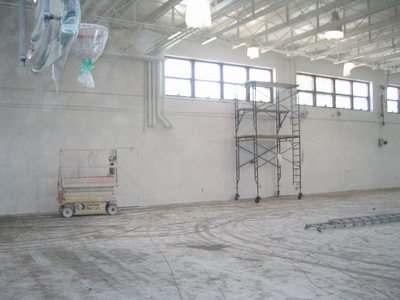 Enrollment keeps rising at RHS and the Brothers renovate Xavier Hall for classroom space and offices. SMA and RHS continue to support each other and collaborate on sports programs, theater and music productions, dances, proms, festivals, community events and academic instruction. The Academy closes its boarding facility. Declining enrollments and declining numbers of Sisters of Charity and Xaverian Brothers lead St. Mary's Academy and Ryken High School to begin talks about combining the two schools. The newly formed high school - St. Mary’s Ryken - opens in September on the grounds of the former Ryken High School. Brother Matthew Burke is the principal. 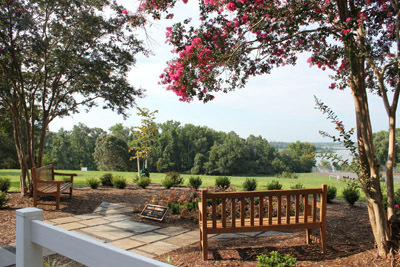 The St. Mary's Academy grounds become home to the College of Southern Maryland. Rupert Hall undergoes interior and exterior renovations. The performing arts building, Romuald Hall, is constructed. The building houses a 320-seat theater and a new Media Center and is home to the history department. The cafeteria is finished and is dedicated as Alumni Hall. The refusbishments to the exterior of Paschal Hall and its classrooms are completed. The lower fields and tennis courts are completed and dedicated. The building known as the "Brothers' House" is refurbished and dedicated to Brother Lambert Bents. It is now known as Lambert Hall and houses the business office downstairs and living quarters for brothers upstairs. 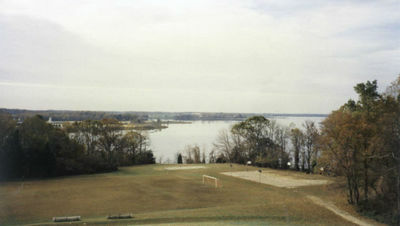 The lower athletic fields are renovated and four tennis courts are built to accomodate the expanding athletics program. The library in Rupert Hall is renovated to become the Chapel of Charity in honor of the Sisters of Charity and is in memory of Sister Sara Ann Abell, Sister Alberta Abell and Sister Pauline Abell. The gym in Paschal Hall is renovated. St. Mary’s Ryken celebrates its 25th anniversary. The new boathouse is dedicated in memory of Father Paul S. Tipton, S.J., In June, construction begins on a new stadium with a turf field and six-lane track. The SMR Stadium is completed. 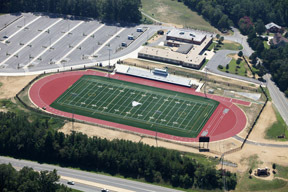 There is seating for 1,000 spectators, a state-of-the-art turf field and a six-lane track. The basement of Romuald Hall is finished and houses practice spaces for the band, orchestra and chorus. 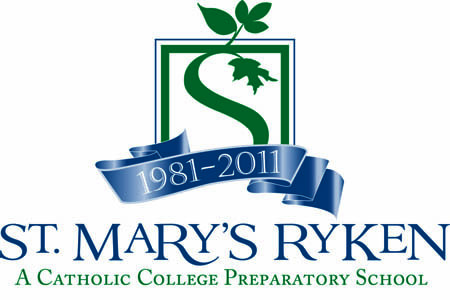 St. Mary's Ryken celebrates its 30th anniversary. The Garden of Remembrance is dedicated in June. 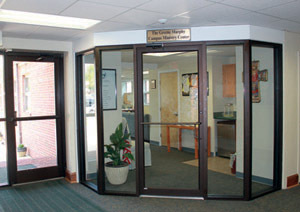 The new Greene Murphy Campus Ministry Center is dedicated on December 19 in honor of Capt. and Mrs. Patrick Murphy and in memory of their parents.